These Panko chicken goujons make a great meal that all ages will enjoy. You could use regular breadcrumbs but Panko gives it an extra crispy crunch. Panko is the Japanese word for breadcrumbs. However, compared to regular breadcrumbs, they are flaky and lighter. They also don't soak up the oil as much so you get a lighter crisply coated goujon. I also bake these chicken goujons in the oven as a much healthier alternative to store bought deep fried alternatives. I've given the quantities for one chicken breast so you can easily increase the amounts depending on how many people you are catering for. You can eat these chicken goujons as they are or try putting them in a tortilla wrap with roasted peppers, onions and a little mayonnaise. Preheat your oven to 190c fan. 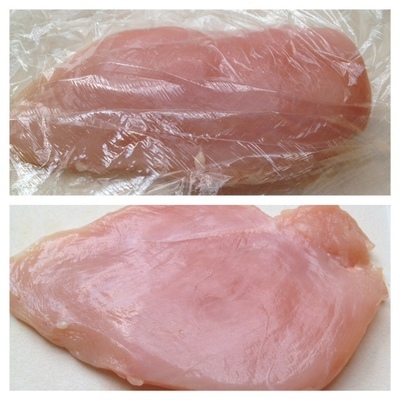 Place a chicken breast between two pieces of cling film and give it a good whack to flatten it slightly. You don't want it too thin, more to even it out so it's the same thickness throughout. Remove from the cling film and cut into strips about 2cm wide. Lightly beat the egg and place in a bowl. Put the flour and Panko in their own separate plates. Lightly coat a strip of chicken in flour. Next, dip the chicken strip in egg. Finally, coat in the breadcrumbs. It can be a little messy so try to use just one hand for dipping in the egg and keep the other one free for dipping in the flour. Repeat this until all your chicken strips are coated. Add a little sunflower oil onto an oven tray and place in the oven. Once the oil is hot, lay out your chicken goujons and turn over to coat them in oil. Pop them in the oven and cook for 25mins, turning once half way through cooking. Check that the chicken goujons are golden brown, fully cooked and piping hot. Let them cool a little and then serve.